My new friend Gary Davies took the framework of my presentation in March and did something I could never do… turn it into a brilliant 1-page diagram called the Energy Decision Tree. Here it is. Thanks Gary! Everyone feel free to steal and use it. Leaving the safety and waste disposal issues to one side, I’d like to understand better whether the overall costs of nuclear really are ‘favourable’, whether its supply is ‘close to infinite’ and whether its emissions are ‘close to zero’. I have my doubts about all three, but I’m open to being convinced otherwise with credible referenced data. Hi Andrew, a good place to start would be my presentation, which you will find on the page “New to nuclear power”. But here’s some of the headlines on those issues. Cost: based on the studies I have referenced in that presentation, nuclear power is cost competitive from the point of view of levelised cost of electricity, and cost of greenhouse gas abatement. It’s more expensive than coal, but that’s fine; we hate coal. The paper recently published in (peer reviewed journal) Energy by my friend Barry Brook and others also demonstrates that nuclear power is the most cost effective form of low carbon baseload generation, with the lowest emissions profile, and it responds most quickly to a price on carbon. Supply: Certainly not infinite with current generation technology. But there is enough to confidently expand, and exploration to date has been extremely limited; there will be more. With the introduction of generation IV technology, it is, indeed, infinite. It consumes all isotopes of uranium, meaning all nuclear waste (which is about 99% U238) and depleted uranium becomes viable fuel. The waste in the world today will be sufficient for about 1,000 years. The energy will be so abundant we can harvest uranium from the ocean. Hence, infiinite. More on that can be found at http://www.bravenewclimate.com . Emissions; best estimate of full lifecycle emissions for nuclear power in Australia using a lightwater reactor is 60g CO2-e per kWh. Current SA electricity comes to us at over 800g CO2-e, for only generation, mining, production and transport i.e. not full lifecycle. That’s close to zero in my book. The cleaner the electricity in the first place (i.e. more nuclear), to closer to zero the lifecycle emissions will be!!! Source is University of Sydney meta review and study, 2006, which you will find in the presentation. I hope that is helpful. You have been too hasty in dismissing renewables as having any role in providing “base load power”( I think you mean base supply power). A little reflection on what renewables are capable of supplying we can look at existing geothermal plants in other countries, and closer to home hydro supplies “base supply” in Tasmania. Its true that SA doesnt have significant hydro, but this should not exclude SA using existing interstate hydro and pumped hydro connected to the NEM grid, to help buffer variable wind and solar. Furthermore SA does have good geothermal resources, and good solar resources. Concentrating solar thermal(CST) with short term thermal storage has been demonstrated in other countries to be able to provide a part of a countries “base supply”. I fully understand your ultimate goal of removing all FF from the system, but you should not exclude renewables in general because any one is not going to totally remove FF on its own, or they are not available in SA, or have not been built in SA. The only criteria should be : can any renewable energy resource contribute to the solution? Neil, do you have specific examples of this: “Concentrating solar thermal(CST) with short term thermal storage has been demonstrated in other countries”? Preferably as a stand-alone plant, but any site with good operating information would very interesting. “Baseload” is a standard term and a real phenomenon of electricity network operation. I don’t know why you would resist using it. Thanks for your comment to which I must respectfully but firmly disagree. My position on renewables was made very clear in the opening post, but I am pleased to have the chance to respond to these more specific points that you raise, since it comes up very often. I am very familiar with the analysis to which you are referring. Full credit to the BZE team for the ambition of that report and it is an elegant piece of work. I have serious problems with it though, not the least of which being the extremely optimistic cost forecasts based on a technology which has, to my knowledge, been deployed once in the whole world, being the CST with molten salt storage. Furthermore, to ignore nuclear on the grounds they gave was an error. I may need to clarify my position. I don’t just want to get rid of fossil fuels, I want to do it now, or preferably yesterday. That being the case, I cannot promote as realistic a super complex system integrating several different intermittent sources of power, that are wildly expensive in the case of solar CST, requiring heaps of brand new transmission infrastructure, backed up with expensive interconnection to interstate hydro programs that are themselves vulnerable to drought, or backed up by gas that emits greenhouse gases. All in the name of getting intermittent sources to be capable of providing baseload. We need a plan that can work and work quickly. This type of approach has, to date, failed everywhere in the world to deliver the result we need. The only places getting by significantly on renewables are those small parts of the world with an abundance of hydro power. Tasmania is one, but they are still clocking up 300g CO2 for every kWh. HDR geothermal is proving a technical conundrum. There is plenty of energy there, but it is simply not ready to give us electricity from kilometres under the ground, 1,000 km from Adelaide. Meanwhile in France, 60 million people get their electricity for 80g CO2e per kWh. 10 times better than South Australia, and the only reason it is that high is that it is only 80% nuclear, not 100%. 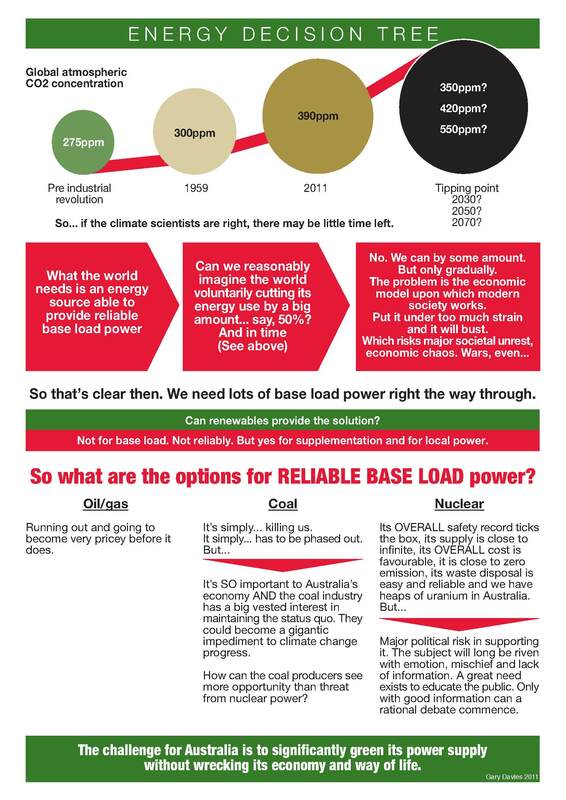 So perhaps to be clear, when I use words like “impossible” to describe renewables providing baseload, I am happy for it to be taken to mean this: “improbable, difficult, slow and expensive to achieve at a meaningful level, to the point that it becomes an extremely high risk strategy with a near certain chance of failure in delivering the job at hand. When the consequences of failure are global catastrophe, such strategies must be avoided”. I make this clear in my presentation, saying about my analysis of renewables “even if I am wrong, it is too great a risk to assume they can do the job”. It is not discrediting renewables to say that they are not cut out for baseload; its fact, and one Australia needs to face up to. I was referring to the oz-energy-analysis web site that hasn’t looked at price just how wind and CST could be integrated in Australia based on wind and solar output. They are just trying to get the data rather than guesses about output( for example the Zero Carbon Australia). The preliminary information indicates that wind and CST with a small amount of pumped hydro can provide a substantial “base supply”. (1) any power supply has to provide about 20GW 24h/day 365 days/year(ie supply a base load, or demand) and in addition provide up to an additional 15-18GW peak demand some of which is required for a few hours every day and some only a few hours per year during periods of extreme demand. We already have a complicated system involving hydro, pumped hydro, OCGT , standy-by old power plants, wind and very extensive transmission lines to provide this peak demand in addition to coal-fired “base-load”. Unless you are proposing that we build some nuclear power plants that would only operate less than 10 days a year, we are going to need OCGT, hydro and or CST. (2) I would agree that reducing CO2 emissions is urgent and for this reason we need to be focusing on short term reductions( displacing coal) that can be implemented in next few years, even if they still require some FF use, as well as longer term solutions such as nuclear and CST that will take decades to be built. Nuclear cannot get rid of all CO2 emissions today, but in decades we could replace all coal-fired power with nuclear. Even France took decades to build nuclear and uses “complicated” power exchange with hydro, FF and long transmission lines. Meanwhile we can build a lot of wind in the next decade, not enough to replace all coal but a significant reduction, while the first few nuclear plants are being built. If you primary objective is to “decarbonize SA” you need to at least look objectively at what wind power is contributing now, could contribute in next 5 years as well as longer term in combination with nuclear CST and geothermal. Don’t dismiss what wind power located just in a small region of SA, on the basis of what it cannot do( ie provide peak supply on demand) but on what it is doing( replacing coal-fired or OCGT operation), and could do if located over a much larger region of Australia. Support for renewables is not time wasting, things are happening, individuals can actually invest in wind farms or install PV or solar hot water. Some may consider talking about nuclear a waste of time because nothing is happening, but I think this is an option we need to have and should be pushing for at least one nuclear power pant to be built ASAP, but not if this means a halt to other low CO2 options. The IPCC released a report this week. Under the MOST OPTIMISTIC of 164 scenarios, renewables could make up to 77% of global power supply by 2050. Which is nice, but still leaves us far short of where we need to be well before then. Under Ben’s plan, which includes lots of renewables, SA could be 100 percent carbon free before then. Which is where we need to be.